Lounge of the Lab Lemming: Where on (Google)Earth #15? that is an absolutely gorgeous meander olain, but I don't know where it is. But that's enough of a hint until we get some guesses posted. Before the clue I was looking upstream of the point of historical interest at the beautiful meanders of the Pripiats River in the area east and west of Petrikov, Belarus. But thanks to the clue I checked downstream of Chernobyl, Ukraine and what do you suppose I found? Thanks, Chuck! P.S. I presume a 24 hour head start is fair? 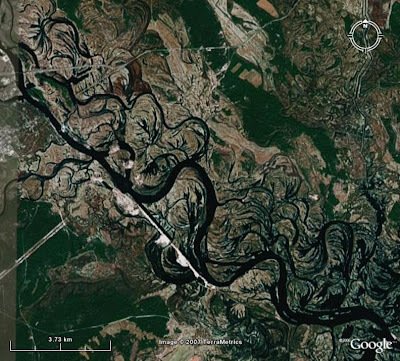 Okay folks, here's Where on (Google) Earth #16?. Good luck! Mind sharing a secret or two? How did you even know which continent to look at? I didn't have a clue which continent to look on at first. In fact, if it hadn't been for your clue I might still be looking. I realized that the area had to have very little topographic relief, but that didn't turn out to be that helpful in narrowing things down. So basically I just started looking all over the globe for well-developed meandering rivers. I knew from the scale that this was not one of the major rivers of the world, but probably a tributary - something on the scale of the Wisconsin River rather than the Mississippi. Beyond that I was simply trying to match the colors of the imagery and the specific geometry of the river. Like I mentioned above, I had stumbled on the Pripiats River in Belarus and it looked promising, but I didn't follow it downstream beyond Mozyr, Belarus because it seemed to lose its meandering character there - though if I had thought about it I'd have realized that it was turning toward the proper orientation. Anyhow, I gave up for a while and didn't check back until after you had posted the hint. After checking Vicksburg I thought about the fact that there were probably other rivers in the Eastern European region that had a character similar to the Pripiats and so I thought about what sort of historical sites I might find in the region and Chernobyl popped into my head. Bingo! P.S. Congratulations on nailing WoGE #16! That was a lot quicker than I expected. It'll be interesting to see if anyone comes up with the journal article.